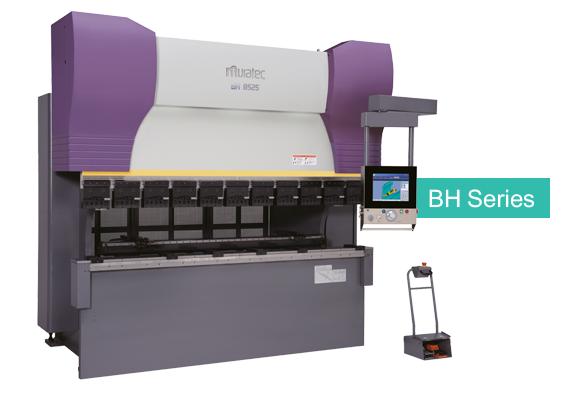 Muratec’s Dual Drive Press Brake BH Series is mounted with a Dual Drive System which separately controls high-speed up and down movement of the ram by AC servo motor and ball screw drive and hydraulic piston down movement. The system enables high-speed drive and stable repeat-stop accuracy to realize high productivity. 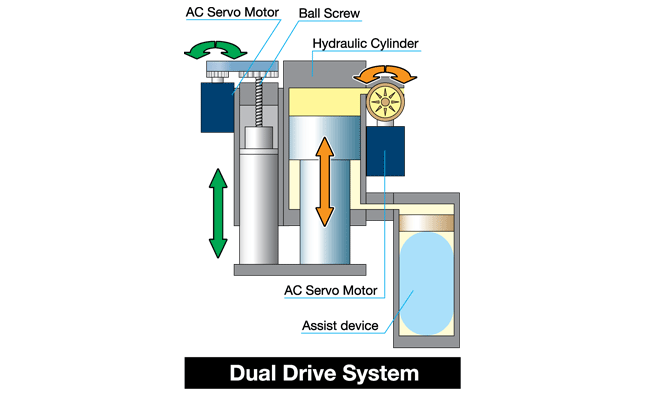 Different from conventional servo hydraulic mechanisms which continuously control high-speed movement and pressure movement of the ram, the Dual Drive System separately controls high-speed up and down movement by AC servo motor and ball screw drive and hydraulic pressure movement. By the Dual Drive System, high-speed downmovement at 200mm/sec and stable repeat-stop accuracy by AC servo motor and hydraulic drive are enabled, realizing high productivity. In addition, the Dual Drive System is superior in total energy saving because it is fitted with a assist device that stores the energy of down movement and returns it during ram up movement. High speed Ram stroke with AC servo motor and ball screw drive. High quality stop accuracy by hydraulic mechanism. Ecology operation by assist device. The Ideal Curve Crowning System is created by conducting FEM analysis of the frame in pursuit of the ideal correction curve with respect to crowning which becomes a problem for the press brakes. Simple and fine adjustment is enabled with use of a monoaxial curving wedge. Automatic crowning adjustment is made quickly for each bending step without stress.